Anche se questo blog non vuole avere valenza politica, facciamo un’eccezione per una buona causa. Mancano infatti ancora pochi giorni per la raccolta firme per i tre referendum per la modifica alla “terribile” legge elettorale che le ultime legislature hanno regalato all’Italia. Visitate il sito www.referendumelettorale.org per avere maggiori informazioni. Although here, ususally, we don’t speak about politics, we make one exception to advertise the “referendum elettorale” that would change some detail of the terrible “legge elettorale” we have here in Italy. There are few days remaining to obtain the number of signatures (500000) needed to make possible the referendum. Please visit www.referendumelettorale.org to find more details. 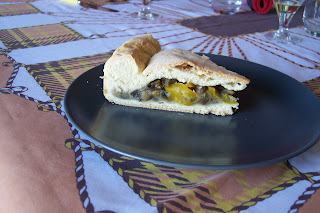 Questa mattina ci siamo esibiti nella preparazione di peperoni e melanzane in crosta di pane. La procedura è stata un po’ laboriosa ma alla fine il risultato estetico (e non solo) è stato più che soddisfacente. 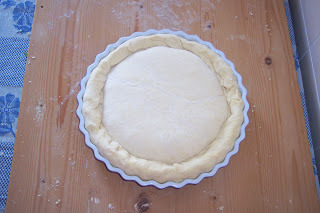 Nelle due foto, la fase di preparazione e quella di degustazione. This morning we prepared a bread cake with pepper and eggplants. It has been a little bit complicated but, at the end, the cake was very good. Last sunday, after our travel to the Nederlands, we ate a pizza with Davide and his girlfriend Maartjie (who comes from Utrecht, NL) at our place. Then we had a pretty good “affogato al caffè” with our home-made ice cream and, at the hand, it was time for a picture. 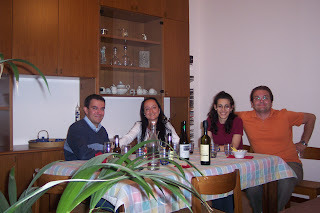 to meet our friend Mattia who is living there until next october. Although smaller, Utrecht is in some way similar to Amsterdam, with a lot of canals, historic buildings and nice place where to find good food and beer (we had a huge and wonderful dinner at “Mikonos”, a Greek restaurant). People too is very lovely. At the end we moved to Rotterdam, a completely different city, full of “original” architecture but poor of history because of World War II bombing. However we found in Delfhaven (a neighborhood in the south west side of the city) a wonderful place where to spend the evening and to find extraordinary restaurants. In particular we suggest the libanese restaurant “Da Parel” and the Tapas Restaurant “Abrikoos”, two lovely places where we found great mediterranean food. We spent also some time around Rotterdam (in the Nederlands is quite easy to move around, although without a car). So we went by bus to Kinderdjik, a UNESCO World Heritage site. In Kinderdjik there are 19 beatiful windmills and it is one of the most suggestive sites we have ever visited. The day after we went by train (trains in the Nederlands work perfectly, not like in Italy) to Delft, the Vermeer town. This site is lovely, full of history and very quiet and relaxing. It is famous in the world for the hand painted blue and white ceramics; they are very nice, but very expensive too. This travel has been quite cheap. We found a good flight with Easyjet, a low cost airline company flying from Malpensa (Terminal 2) to Amsterdam Schipol airport. It is sad for italians to make a comparison between the two airports. One, the italian one, is small, not easily connected with the city and in general poor of courtesy and informations. The other one (Schipol) is beatiful, full of shops and information with a very fast connection, by train, with the center of Amsterdam. Ieri sera abbiamo avuto i freschi sposi Matteo (Repox) e Laura a cena. Dopo antipasti vari, gnocchetti sardi con sugo a base di speck e zafferano, involtini di vitello, gelato al fiordilatte con amarena e un’ottima torta (portata dagli ospiti) di pastafrolla con ricotta e cioccolato, ecco che riusciamo anche a fare un autoscatto. 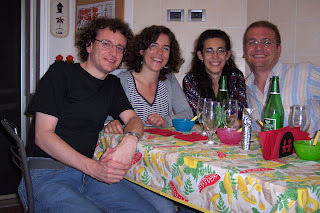 Yesterday we had Matteo (Repox) and Laura at dinner. We started with appetizers and then we eated “gnocchetti sardi” with speck and saffron sauce, roulade of veal, black cherry ice cream and a very good cake short crust based with ricotta chese and chocolate. Then, we were able to take a picture of the group.